All Ducts Australian designed and made, audiometric test rooms, and sound field audiometric test rooms, are superbly crafted to satisfy all the requirements of the Australian Hearing Conservation Code AS/NZS1269.4-2005 Occupational Noise Management Auditory Assessment, and they also meet the Australian Hearing Services specifications ATR-1 & ATR-2. These rooms can be made to any size, and any shape to suit the space you have available. The room is constructed, so should you need to move premise, our services are available to ensure that the acoustic integrity of your room is maintained through a simple relocation! 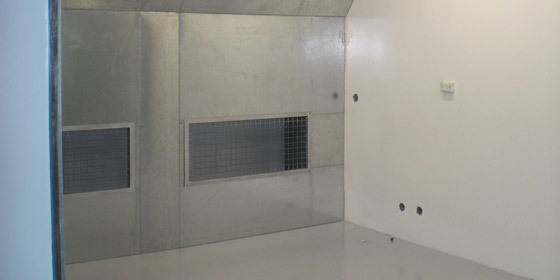 All Ducts designed and manufactured Audiometric Free Field Booth has been engineered for audiometric testing in a quiet environment - hospitals, medical rooms or consulting rooms. Each booth has been manufactured to the highest standard of manufacturing utilising ISO 9001. The booth's acoustic design eliminates outside sounds and noise so that accurate audiometric assessment can be conducted. The booth is pre-fabricated and packed ready for on-site assembly. The modular design is easy to assemble and disassemble making it ideal for relocations. All Duct Fabrications have installed audiometric rooms Australia-wide for clients such as Australian Hearing Services, University of Melbourne, Cochlear, and in addition we have supplied many 'turn-key' installations (design, manufacture, install and sound test) around the world including sites in London, New York, Geneva, Singapore and Vietnam. The noise reduction performance of a Free Field Booth has been established in accordance with the testing guidelines set in the Australian Hearing Conservation Code AS/NZS1269.4-2005 Occupational Noise Management Auditory Assessment.